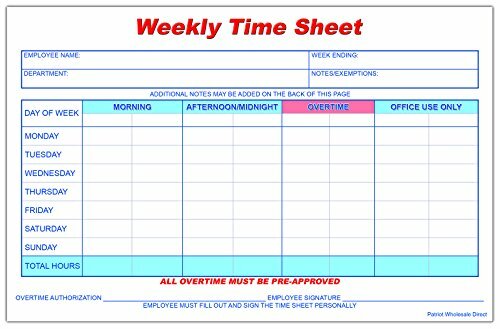 Patriot Wholesale Direct is proud to offer our Weekly Time Sheet Notepads. These weekly time sheets can be filled out by employees to report time worked. The time can be broken down by shift and overtime. Also, allows to show overtime work was authorized by manager. Each sheet is 8.5x5.5 and each notepad has 50 sheets per pad with 5 pads coming in each order for a total of 250 sheets. The sheets are printed in full color and are printed on 70# paper. Each notepad has a chipboard backing for added strength. Proudly made and printed by Patriot Wholesale Direct in the USA. If you have any questions about this product by Patriot Wholesale Direct, contact us by completing and submitting the form below. If you are looking for a specif part number, please include it with your message.